I have my whole family over for dinner tomorrow evening ahead of my big sister’s wedding on Sunday and I’m determined to make a (nearly) entirely make-ahead menu so that I can relax and have fun with everyone. With it being summer I feel like I can get away with a more casual, cold meal so we’ll start with my token ‘crudites-and-dips-on-wooden-boards’ which if you follow me on Instagram you’ll know I’m a big fan of. To follow I’m serving hot roast chicken with caramelised shallots, my friend Jo’s amazing cabbage salad, a green bean salad and a mango and coconut rice dish. But on to the part you care about most – dessert! If I want to make something easy, ahead of time and super delicious, I always turn to my decadent flourless chocolate cake or a plum torte by the queen of British baking – Mary Berry! 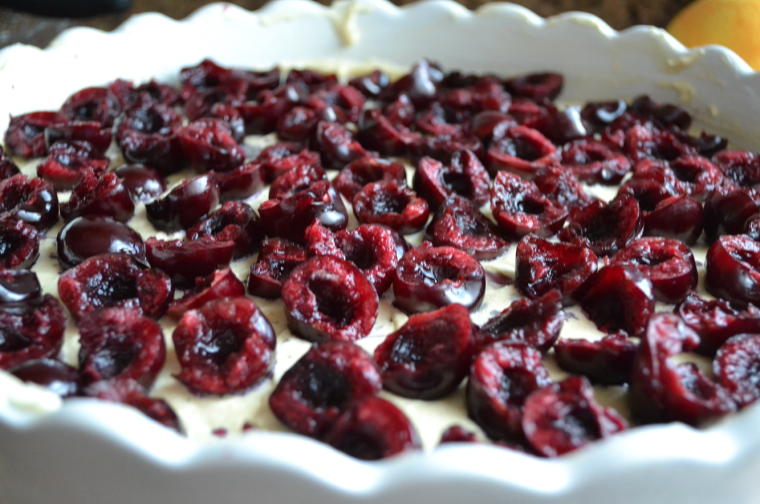 This torte can be make with any stoned fruit and served hot or cold – perfect for me! 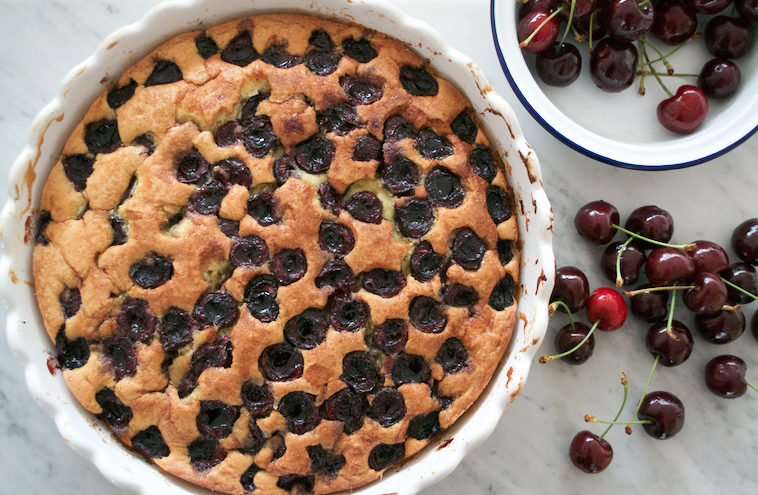 As usual, I have adapted the recipe slightly (I’ve doubled up on cake batter and I’m using cherries instead) – to make in its original form, simply halve the recipe and use a 22cm loose-bottomed cake tin. Make sure to check out my Instagram feed tomorrow for some snaps of all the food! Preheat your oven to 180°. Grease or line a 30cm baking dish. 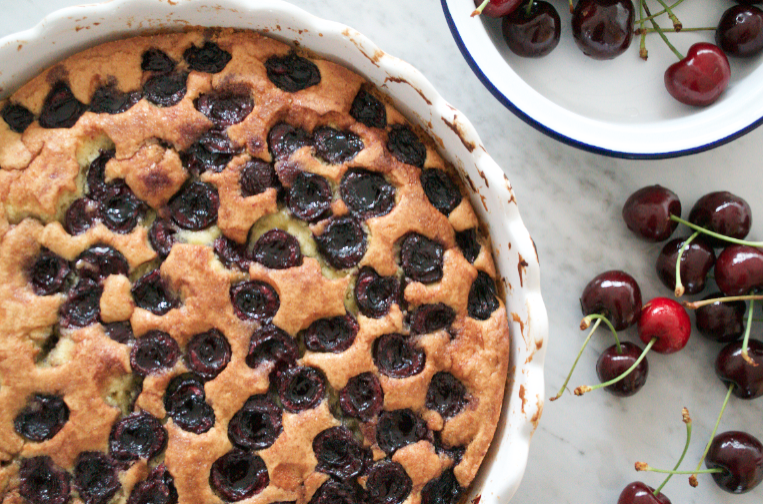 Beat everything apart from the cherries and demerara sugar together in a large bowl until you have a nice smooth cake batter. Spoon into your baking dish and spread the mixture out evenly. 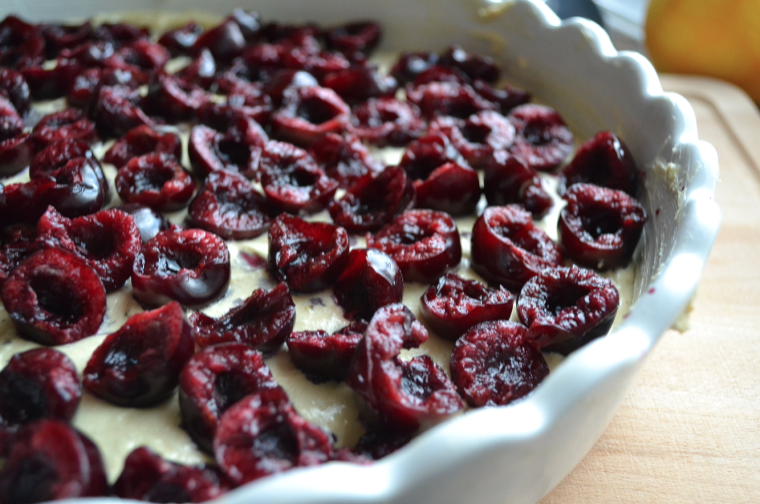 I just drop the cherries on to the batter in a random pattern but you can place them more carefully in a more purposeful way if you prefer. No need to push them in as the sponge rises up around them when baked. Sprinkle with the demerara sugar and bake for around 30min – when the top is a light brown and the sponge springs back when pressed it’s ready. If you want to serve this dessert hot but still make it ahead of time you can assemble the torte in it’s entirety and simply pop it in the fridge for up to 12 hours before cooking. Hi Tamara. I hope this message finds you well? Well I’m ready to make another of your delicious recipes, the cherry cake. If I’m feeling a little lazy, do you thing it could work with glacé or pitted tin cherries, or are fresh a must? !